Oooh, this is a blast! 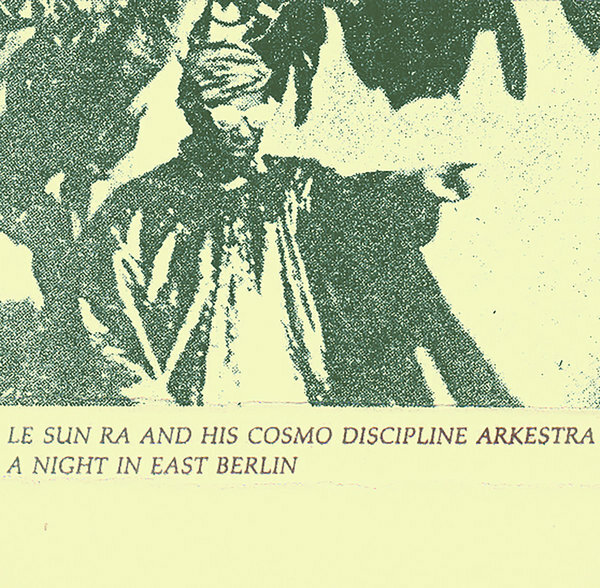 Sun Ra’s 1986 soujourn to a pre-unification East Berlin comes back around on the release’s original format via Moscow’s Post-Materialization Music label. Documenting a killer, wild and free session from Le Sun Ra And His Cosmo Discipline Arkestra, the 40 minute recording features Marshall Allen, John Gilmore and Pat Patrick among the Arkestra’s mass, all converging and diverging the definition of jazz as only they can. From entrancing squall to skronky electric organ riffs to a charming take on Duke Ellington’s Prelude To A Kiss, and on thru bubbling versions of their evergreens We Travel The Spaceways and Rocket #9, it lands on a freaking amazing Second Stop Is Jupiter, ready for your to do it all again.